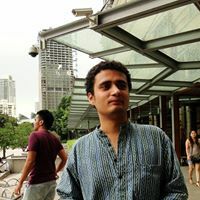 Sayan ‘Prof’ Ganguly was the Co-Curricular Affairs Secretary of IIT Madras (2008-09) as well as Events Core, Shaastra 2007. He presently works with Shell in Malaysia.Fondly remembered by his batchmates, and recalled by many of his juniors as an amazing (as well as inspirational) orator, Prof was also the Editor of The Fourth Estate.Here he talks about his experiences in insti. A better part of my five years at campus was spent discovering how terrible I was at things. I saw my friends win medals at inter-IIT, compose songs for performances during Saarang and display stunning and frankly unnecessary knowledge of obscure facts during late-night quizzes. Acknowledgment of the fact that I was surrounded by a group of special people in the classroom and outside of it was reinforced, often brutally, each and every day. By the time I graduated, I had convinced myself of one important maxim. Every student in campus did at least one thing better than me. As a corollary, it was also true that there was perhaps one thing each one of us did better than the rest. The lucky among us discovered that gift while in campus. Others discovered it soon after graduating. The rest of us are still looking for it. This process of self-discovery is seldom easy and we should welcome any help we get during this process. Help can take various forms. It can be a person or a certain circumstance or a well-disguised opportunity. When the Centre for Innovation was envisaged back in 2006-07, it was hoped that it would be play the role of an obvious opportunity for students to discover their talents. It was to be that place where one could hope to discover what it was that he or she was better at than the rest. CFI’s history has already been elegantly captured by the founder member on the walls of CFI and can be read at leisure by anyone not familiar with the journey. 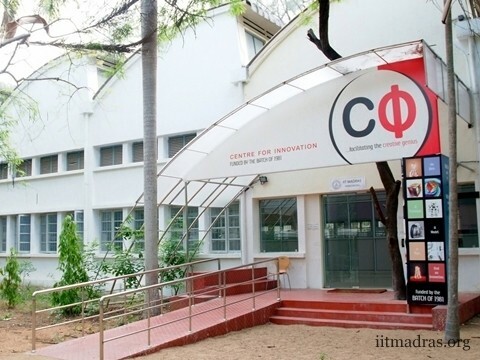 What I want to share is the wonder and satisfaction I experienced when I visited CFI last December after five years and how it compared against my time at IITM (2004-2009). At its conception, CFI seemed like a very ambitious idea. It was to be a place where one walked in with an idea and walked out with a product. For it to become a reality, the alumni provided a generous donation, the administration provided the much-needed infrastructure and support and a small group of students offered the necessary time and leadership to execute the plan. The unspoken but overriding concern was whether such an elaborate and expensive facility would be used adequately for what it was intended. The preliminary signs were a bit discouraging. For a campus where the primary co-curricular activity was gaming and Orkut (these are the dark ages of social media I am talking about), the concept of CFI was too esoteric for the average Joe and didn’t garner much attention. Yes there was a small minority who were excited about this significant development but overall there was a palpable indifference to the whole idea. It was strange that in an engineering institute of repute, hardly anyone seemed interested in building things that worked. Of course the lack of proper facilities, mentoring and opportunities had compounded the problem and quickly extinguished any flicker of interest one would have. The faculty never missed an opportunity to indicate their disappointment at this dire state of affairs. It was a time when the pinnacle of engineering achievement would be the one or two Spirit of Engineering projects at Shaastra with a very charitable definition of success. It was in this daunting environment that the decision to create CFI was taken. Hence we should always be thankful for the determination and foresight displayed by the alumni, faculty, administration and the small group of students in setting up CFI. They gambled their time, money and infrastructure when there was little evidence to suggest that this venture would be successful. Such optimism and daring is increasingly uncommon in the real world. Today CFI is unrecognizable compared to what it was in 2008. If you cannot visit the actual facility itself, visit the Facebook page or the blog to understand what I am talking about. The range of activities is staggering and the list of both national and international successes is growing at an astonishing rate. The phenomenal rise in the number of people participating in projects, the deepening complexity and ambition of the projects being attempted and the mature leadership of the students heading CFI is clear evidence that the original vision behind CFI has been realized in a resounding manner. People are staying back after graduating to complete projects which they started. BTPs and DDPs are emanating from intricate long-term projects. Of particular interest to me personally is the momentous progress in Robocon, FSAE and Aeromodeling related activities. For each of these activities, one can pen long histories from the previous decade, rich with stories of intrepid personalities and their incessant struggle in face of disappointments. Today when I see IITM represent the country in international competitions, I am fondly reminded of those spunky group of students less than ten years ago trying to build robots, cars and aero planes in their hostel common rooms with few tools and fewer role models. We can agree that the brave gamble by the institute has indeed paid off and I am sure the people who decided to go ahead with CFI seven years ago are a bunch of very satisfied people today. While celebrating the successes, let’s not misinterpret the lessons we have learnt. The quality and competence of the students have not changed. What has changed is the coming into existence of an extraordinarily versatile platform. A platform which not only provides the physical tools to craft one’s ideas into reality and a stimulating environment to foster creativity but most importantly a regular stream of role models for every batch of first years to idolize year after year. Unlike the previous decade, now we have numerous success stories which can be emulated and improved upon. We now know that things are possible and it’s up to the individual to define the limit of his or her imagination. For the current students, I have very little to advice and much to complement. Please keep up the wonderful job being done and always remember that IITM is perhaps the only institute in the country with such a facility. While the extensive success you guys have garnered in such a short time will surely be enough to motivate the future batches, let’s not forget the smart people who struggled, failed but refused to give up to ensure CFI realizes its vision. When I went through the numerous pictures on the CFI walls, I was forced to notice that the faces of some of the early CFI stalwarts from 2008-2010 period were missing. So my advice is only this. If you could, try to get in touch with them, get to know them and tell them how well you are doing. It would make them really happy. For the institute administration and the faculty, I would like to take the liberty to provide some unsolicited feedback. I think we can all agree that the times have changed. Students can no longer be accused of lacking initiative and drive. The institute took a big chance with CFI but there is absolutely no doubt that the student community has come through on its promise of using it well. The original intentions of the alumni and the institute have been realized. This means it’s time to raise the stakes. Now my suggestions below are based on only one recent visit to CFI and talking to some of the students. It is possible that my understanding of the issues CFI is facing today is imperfect. The current student team leading CFI is in a much better position to frame the problems with more specificity. But I hope to at least widen the debate on where CFI should go from here. I want to dwell on two issues, that of the funding process and physical space. Funding: The ‘good’ old days of having 1-2 projects in a year which would be funded by the Gymkhana are unmistakably over. The number of projects has grown tenfold and so have their capital expenditure. It would be a terrible tragedy if projects start getting shelved or delayed because of money. It is time when the institute commits to a fixed and more importantly an appropriate budget for CFI every year. Now that the students have consistently demonstrated that they will use the money well, they should be rewarded with a straightforward, red-tape free mechanism for funding. Do we really want students to invest most of their time running around the admin block trying to get large out-of-pocket expenses reimbursed or pay-orders processed? Handling bureaucracy may be a character-building exercise but for every hour we spend entangled in red-tape, we end up lowering the productivity on the CFI shop floor. And while we are simplifying the finances, let’s also allow a complementary system which makes it easy for private donors (primarily the alumni) to make up for any shortfall. It is understandable that as IIT is not a private institution, it needs to follow statutory checks and balances when it comes to finances. But it needs to be urgently recognized that the current way of funding CFI projects requires simplification. Space: An unexpected outcome of the success of CFI is that the working space which looked spacious and sprawling a few years ago has begun to get look constricted and crowded. The optimism and prescience of 2006-07 needs to make a comeback and some serious thought be given to how the CFI working space be expanded. The administration has done an extraordinary job in expanding the general infrastructure at campus in the last few years and in view of that this problem of space is the easier one to solve. Addressing the question of finances and space would go a long way in ensuring sustainability of CFI in the current decade. The students are more than capable to take care of rest of the issues pertaining to sustainability and growth. It is rare for an idea to realize itself exactly in the way it was intended. It would have been easy for the initial enthusiasm for CFI to fizzle out in a couple of years. It was also possible for it to morph into something unproductive and ineffectual. It is to the credit of all the students involved in the last six years that they ensured the many pitfalls were avoided. The problem is no longer about whether students will be using this facility. The challenges are different now. Are we going to have a satellite in space by 2015? Will IITM become the reigning world champions in robotics before the decade is over? How many companies will be incubated out of CFI by 2025? Will CFI be generating its own income stream by 2030? Aren’t they wonderful challenges to have? I definitely think so. Nice to see how CFI has contributed to grounding engineers in tech. Of course there are still quite a large majority who go for an MBA.